Many of Washington state’s recreational cannabis cultivators are using half or less of their licensed canopy, driven in part by low wholesale prices and a dearth of available capital investment, according to a report conducted by the state’s regulators. 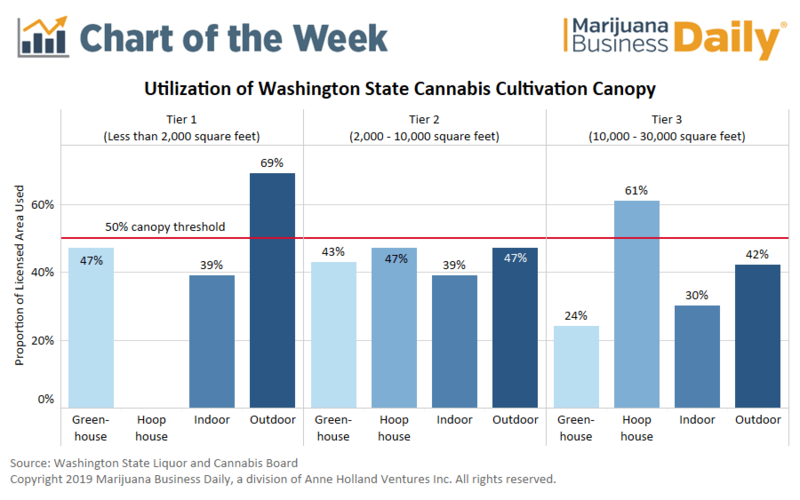 Over the course of a year, the Washington State Liquor and Cannabis Board (LCB) surveyed 1,155 licensees to determine capacity utilization – and why the results were so low. Even though the canopy report shows most cultivators aren’t growing at full capacity doesn’t mean overproduction isn’t a problem, according to Jeremy Moberg, CEO of CannaSol Farms in the Okanagan Valley and president of the Washington Sungrowers Industry Association. “The only piece of evidence you need to know that there’s overproduction is that you can buy an ounce for $40 down the street,” he said. The LCB has the authority to change a cultivator’s license type if the business fails to use at least 50% of its allotted canopy, though regulators currently have no plans to do so. Rather than stepping down the licenses, Moberg would like to see the LCB go after the cultivators who are growing beyond canopy limits. Reducing canopy for companies operating at lower capacity would be “taking a meat cleaver to a scalpel problem,” he said. 2. Access to capital is problematic. A lack of capital creates a barrier to increasing the value and footprint of your business, Pickus noted. But the low price point for flower may limit investor interest if flower is a grower’s sole focus. “The biggest return on investment that we would see in Washington is going to be on the R&D (research and development) side, the talent-acquisition side, areas like that,” Pickus said. 3. The prohibitive cost of expanding cultivation facilities. Fully building out a cultivation operation can prove to be a cost-prohibitive undertaking. Alex Cooley, co-founder and vice president of Seattle-based Solstice Cannabis, estimated a cost of $100 per square foot to develop indoor grow space, but it could easily hit $250-$300 per square foot, depending on the bells and whistles in the operation. Cooley offered a ballpark figure of up to $25 per square foot to develop an outdoor cultivation operation. He said the price for greenhouse development was somewhere between indoor and outdoor setup costs. “If you’re developing 30,000 square feet of canopy, that runs up to a high investment very quickly,” Cooley said.